Our product range includes a wide range of fish shelf life extender. 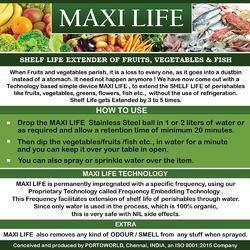 Drop the MAXI LIFE stainless steel Ball, into a mug or bucket of water and dip the Vegatables, fruits, fish etc., in the water and keep it in open. No refrigeration required. The Shelf Life of the items gets extended by 3 to 5 times. Specific Frequency is impregnated permanently to the SS Ball, which transfers the frequency to the water and we get the desired result. Since it is only water, the treatment is 100% Organic and there are No Side Effects at all. Price: Rs. 850/- all inclusive. Looking for SHELF LIFE EXTENDER ?